About "Area of quadrilateral when four vertices are given"
Here, we are going to see, how to find area of a quadrilateral when four vertices are given. Let us consider the quadrilateral given below. In the above quadrilateral, A(x₁, y₁), B(x₂, y₂), C(x₃, y₃) and D(x₄, y₄) are the vertices. 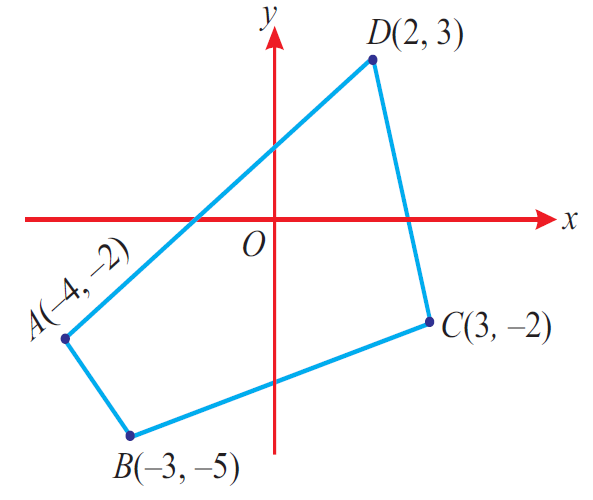 To find area of the quadrilateral ABCD, now we have take the vertices A(x₁, y₁), B(x₂, y₂), C(x₃, y₃) and D(x₄, y₄) of the quadrilateral ABCD in order (counter clockwise direction) and write them column-wise as shown below. And the diagonal products x₁y₂, x₂y₃, x₃y₄ and x₄y₁ as shown in the dark arrows. Also add the diagonal products x₂y₁, x₃y₂, x₄y₃ and x₁y₄ as shown in the dotted arrows. 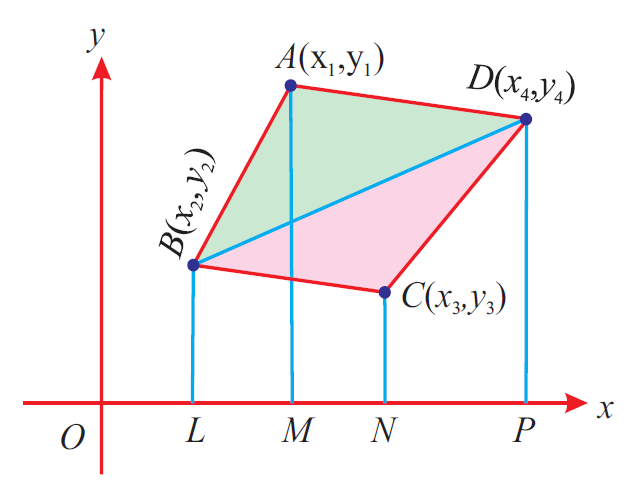 Now, subtract the latter product from the former product to get area of the quadrilateral ABCD. Hence, are of triangle ABC is 28 square units. (i) (6, 9), (7, 4), (4, 2) and (3, 7). After having gone through the stuff given above, we hope that the students would have understood "Area of quadrilateral when four vertices are given". Apart from the stuff given on quadrilateral, if you need any other stuff in math, please use our google custom search here.